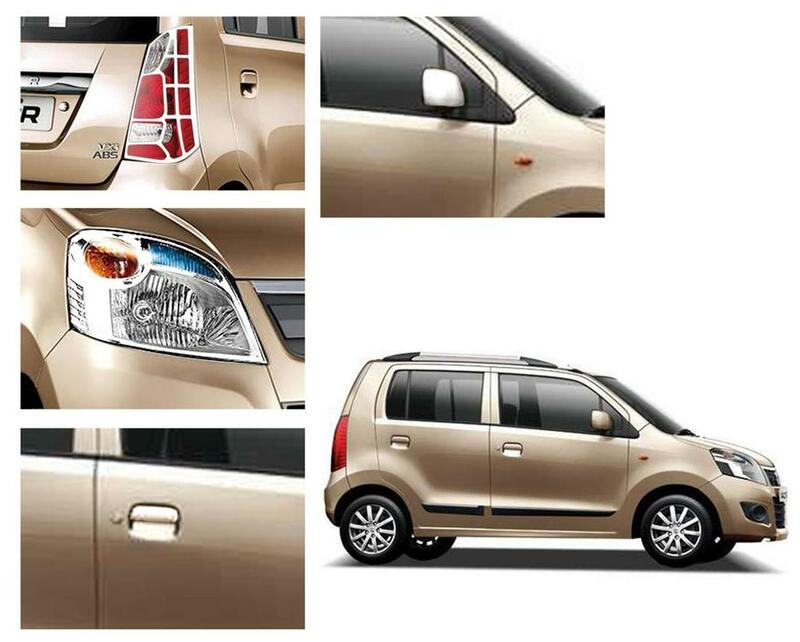 Auto Pearl-Chrome Plated Premium Quality Accessories For - Maruti Suzuki WagonR 2010 - Set Of 4 Pcs. Total Contents: 1. Head Light Cover 2 Pcs. For (Left & Right.) 2. Tail Light Cover 2 Pcs. For Left & Right. 3. Mirror Cover 2 Pcs. For (Left & Right.) 4. Handle Cover For All Four Handles. Tail Light Cover Add A Brilliant Shine That Will Gleam Lifelong These Applications Are Built From Automotive Grade These Durable Tail Lamp Moldings Are Discoloration Resistant Color Chrome-Silver Material Chrome Head Light Cover Beautifies Your Tail Lights And Head Lights In High-quality Chrome. Doesn't Corrode, Rust Or Pale. Stands Up To Harsh Weather. Installs Over Existing Head Lights. No Drilling Or Cutting Required. Mirror Cover ABS Chrome Side Mirrors Are The Fastest Route To Eye-popping Gleam. Specialized Injection Molded Shape Assures Perfect Fit. Triple Chrome Plated ABS. Handle Cover Triple Mirror Chrome Plated Finish. 3M Adhesive Tape At The Back. Highly Durable ABS Plastic With Triple Layer Chrome Finish. Easy Installation, Comes With Adhesive Tape How To Install Clean Water Or Oil Or Dirt On The Attaching Part. Ensure Direction (Left & Right) Before Removing The Tape At The Back. Take Plastic Covers Of The Tape. Push The Attaching Part With Proper Pressure.